The unknown people behind the highly distributed attack are using more than 90,000 IP addresses to brute-force crack administrative credentials of vulnerable WordPress systems, researchers from at least three Web hosting services reported. At least one company warned that the attackers may be in the process of building a “botnet” of infected computers that’s vastly stronger and more destructive than those available today. That’s because the servers have bandwidth connections that are typically tens, hundreds, or even thousands of times faster than botnets made of infected machines in homes and small businesses. So, what can you do to build a secure WordPress installation? A few things. This plugin by Chris Wiegman gives you a ton of options to better secure WordPress, including interesting features like turning off your WP admin area during certain parts of the day. Grab the plugin from the WordPress repository here. WordPress likes strong passwords, but make sure you have many users or a multisite setup, you should require all levels of users to use strong passwords. If you are generating passwords when you add a new WP user, use a strong one. I use this site often to generate random keys and passwords. Why are strong passwords important? Let’s look at three potential passwords: doctor1, 6TrSB45aO6 and bl+4NF=(N35+ixq. For the password 6TrSB45aO6, WolframAlpha calls this password very strong. 55,000 years to enumerate compared to 9 days on the last password, that’s pretty good. Let’s run the last one. Where it took 55,000 years last time, now it takes 125.3 quadrillion years. Can you even comprehend that number, and that’s trying 100,000 passwords a second. That’s a strong password. At 100,000 passwords a second, that one would take 2.669×10^66 years. I’m not even sure how many zeros that number would have. A lot. I use 1password and all my passwords are 50 characters, for everything. It’s a bit pricey, but I was able to find a half-off coupon on the web pretty easily. What’s nice is that you can store your passwords securely in Dropbox and have all your passwords at home, the office and so on. LastPass is another good alternative. Many times, when you set up WordPress, the admin user is made by default. This is fine at first, but immediately create a new user, give that user administrative powers and remove the admin user. That’s a common target for hackers. It’s good WordPress security practice to rename your tables from the default titles, because hackers often look for installs that haven’t been changed, and can write their malware to look for tables named in most cases the default, such as wp_usermeta. You can make it whatever you like, just make sure you end it with an underscore. The next step is to rename your real database tables. This is slightly more tricky if you don’t have access to the database itself or something my PHPMySQL admin. You can learn more about this process here. For several months, I’ve used Google’s Authenticator app to sign into all of Google’s products as well as other sites that support it like Dropbox. While it’s a pain to enter in one more piece of data, it’s as easy as copying the information from your phone, which is something we all have with us 24/7. When you login to Google, you’re asked for a 6 digit code, which you can have texted or called to you or use the Google Authenticator app, which gives you the code to enter. 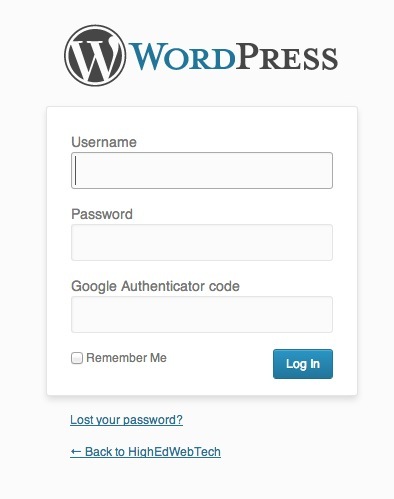 That, friends, is a pretty secure WordPress setup. Chances are very slim to none someone is going to crack both your strong password and the code generated by Google. Previous Previous post: What Can Higher Ed Learn from JC Penney’s Failure?